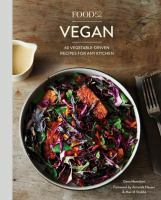 Have you ever read through a new cookbook and wanted to try every single recipe - but not actually have to cook it yourself? A few friends and I have started up a cookbook club, which is really just a fancy word for a coordinated potluck where everybody makes a dish from the same cookbook. I had heard about this idea a few years back, but this post on SeriousEats.com gave us some tips on how to get it organized, and motivated us to finally set a date. 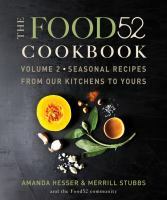 The cookbook that was chosen for our first dinner is actually a group of cookbooks inspired by Food52.com. The administrators of Food52 describes its website as a community that seeks to encourage the love of food and cooking (after all, we cook 52 weeks out of the year) and believe that "if you want to eat better, and you want to help change our food system, you need to cook." It's not surprising that they've come up with their own line of cookbooks - many of the best new cookbooks come from food blogs - but the Food52 books are unique because they are not authored by a single person. Baking and Vegan contain creative and unique recipes suggested by Food52 blog contributors and are curated by the editors to make sure a great mix of the best new recipes are included. 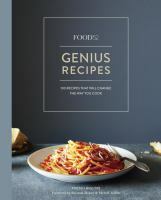 Genius Recipes is a compilation of 100 remarkable recipes from famous chefs that "might involve an unexpectedly simple technique, debunk a kitchen myth, or apply a familiar ingredient in a new way." Michael Ruhlman's fried chicken recipe is in here, as is Julia Child's recipe for zucchini and rice gratin. 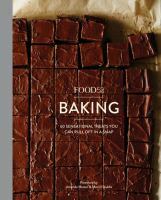 My favourite of the bunch is The Food52 Cookbook: Volume 2: Seasonal Recipes. I love any cookbook that is arranged by season, but this book is special because it recreates the feel of the food blog. Each recipe was originally featured on the website, and is introduced with a "Who - What - How - Why we liked it" section that includes the comments of the recipe contributor, as well as suggestions for serving. At the end of each recipe, there is another short section that offers comments and technique suggestions found in the recipe's comment section on the website. I rarely follow recipes by the letter, and I really like reading the comments on blogs to see if I should up the spice level, substitute another vegetable. I think it's really neat to find these tips included in a printed cookbook! If you're wondering.... I haven't made my final decision on what I'm going to bring to supper this month, but I'm leaning toward the Sausage and Kale Dinner Tart. Or maybe the Okonomiyaki....?